It’s hard to believe we’re halfway through another week! Work is keeping me busy. It took me a few days, but I finally finished the edits to the 60+ page document that Richard gave me. I have been helping Becky with the list of invitees for the Board Meeting next month in Ann Arbor, Michigan. Also, I’ve been meeting with Jim and he’s given me a couple projects to work on throughout the summer. Last night, Megan invited me out to meet the other interns at her consulting firm. Between the five of us, we had the following colleges represented: Stanford, Duke, Georgetown, William and Mary, and The College of Saint Rose! It’s really interesting to learn where people are from and fascinating to hear what they are working on this summer. So while it’s great meeting new people in DC, I’ve been thinking of all of my friends in NY. I’ve had the chance to catch up with a lot of my friends from school recently which has been really nice. I can’t believe Saint Rose is having the first session of orientation already. It doesn’t seem like that long ago that I was going to orientation, yet here I am getting ready for my final year..crazy! 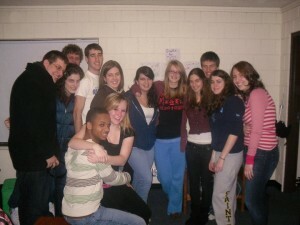 Below is a picture taken in Alumni Hall (the dorm where I will be the RA next year!). Everyone in the picture met freshman year and we’ve stayed friends ever since. While I miss everyone at school, I think the group that I’ve been thinking of the most is the staff at Camp Guggenheim. Guggenheim has been a huge part of my life since I was 12 years old. 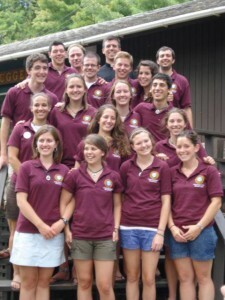 I was very lucky the past two summers to be on staff at camp with some incredible people. This past Sunday, the first group of campers arrived for the week. While I know they are all incredibly busy, I’m hoping to get to catch up with the staff soon. I’m fortunate to have my Guggenheim friends and am excited to volunteer at camp and see them for a few days when I get home from DC! Below is a picture of the staff from last summer. ← The family in DC!